By now, Telluride’s trails are good and buried under blankets of snow that won’t recede until the spring thaw. But bike lovers don’t have to pack up their wheels for the winter. 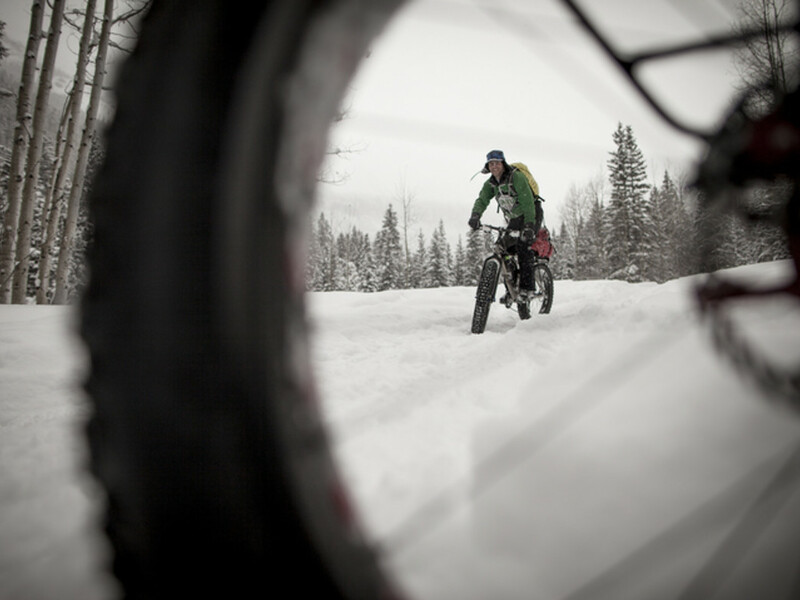 Thanks to fat bikes, you can ride year-round: on sand, packed dirt, rocks, and yes, on snow. 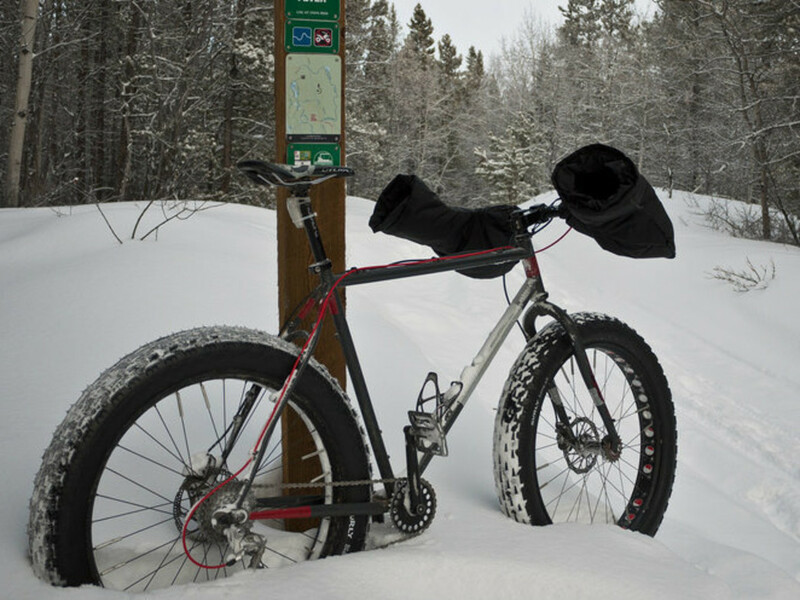 Fat bikes, which were first developed for long-distance snow biking in Alaska more than 20 years ago, are built to accommodate tires that are nearly five inches wide. These bulbous tires may look cartoonish, but they provide flotation and stability on all sorts of less-than-ideal biking surfaces, snow and ice prime among them. Funny-looking as they may be, fat bikes have become hugely popular in mountain towns like Telluride in recent years because, simply, they are fun as hell. With a fat bike, you can explore your favorite trails under a cloak of white, pedal to huts and cabins, and avoid holiday ski traffic on the slopes. 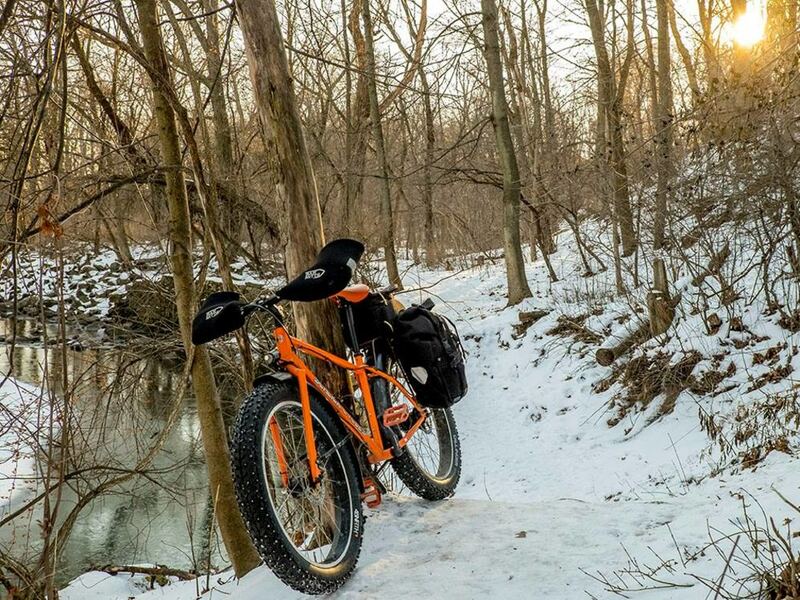 And because fat biking trails are typically optimal when ski conditions aren't, a fat bike makes a perfect complement to a pair of sticks. (Just don’t try it on a powder day). Sound appealing for your next winter adventure? Here’s all you need to know about fat biking in Telluride. Thanks to the Town of Telluride and the San Miguel Bike Alliance , there’s a fat-bike specific trail system on the Valley Floor—the 570-acre parcel of open space land at the town’s doorstep. These trails follow the river, trace the old railroad grade and dip through the small hills and big meadows of the land, making them great for beginner riders and those looking for an easy cruise. Trails that get packed down by dog walkers are also good options for winter fat biking, including Bear Creek, which begins right in town, and Jurassic, which flows from Mountain Village to the Valley Floor. Other options include dirt roads that get some traffic to pack the snow — such as Alta Lakes Road. For those who don’t feel like route-finding, Bootdoctors & Paragon Outdoors offers custom tours, family tours, and a Telluride Brewing Company tour, which takes riders across the Valley Floor to the town’s homegrown brewery for pints of Facedown Brown or Tempter IPA. (A shuttle will haul participants back to down so you don’t have to worry about being tipsy on the ride home.) The Telluride Adventure Center’ also runs tours. Surly and Salsa remain veterans of the fat-bike craze with classic models like the Pugsley and Mukluk. But by now, nearly everyone has climbed aboard the fat-biking bandwagon. Specialized, Borealis, Kona, and Trek have all released their iterations of the big-wheeled bikes, brands like Fatback specialize in the bikes and there are even custom-built frames by companies like Twenty2, Black Sheep Cycles, and Moots (all based in Colorado). The good news is that will all these bikes flooding the market, it’s relatively easy to find a fat bike that won’t break the bank. Steel Pugsleys retail for around $1,700, while Mukluk Muk3s go for a little higher. 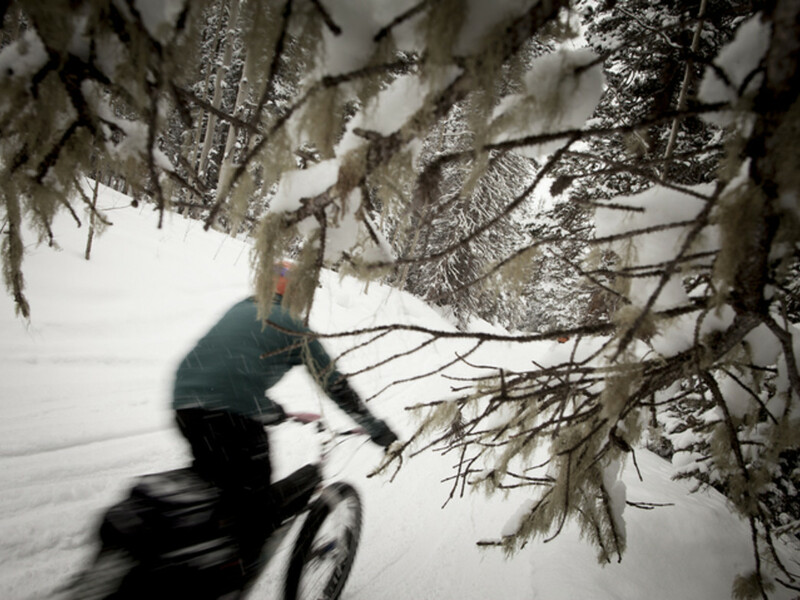 All of Telluride’s bike shops have fat bikes to peruse. Not ready to shell out for one quite yet? If you want to dip your toe into this fun sport, try renting. Check in with the folks at Bootdoctors/Paragon Outdoors, Box Canyon Bicycles, and Gravity Works to find a bike to borrow or demo. They offer fleets that range from Konas to Borealises. The good folks at these shops can also provide you with maps and suggestions for rides. Rentals start at around $40 a day. There are inevitable questions that come with fat biking. Things like: Do I wear bike shoes? Am I going to freeze to death? How do these things handle on downhills? (Answers: No, probably not, and surprisingly well). Here are a couple of tips to get you rolling along smoothly. • Wear boots, preferably something that will grip flat pedals. Bogs do the trick, or high-top hiking shoes. But leave the little bike shoes behind, unless you want frozen ankles, and wear sturdy socks. • Don’t forget a helmet. Just because snow is soft and fluffy doesn’t mean you won’t go careening into a sign or tree. • Leather gloves come in handy. Since your hands are thrust out in front of you, they can get cold easily. Thin gloves meant for road or mountain biking don’t do the trick. • Layers are vital. It can get cold quick when you are biking in the winter; start with a base layer and top off with a solid, wind-resistant jacket. • Bring a light. With the short days of winter, it’s always a good idea to bring at least a headlight (if not a nightlight) setup on a ride, especially if you venture out in the afternoon. Because riding is much more fun when you can see the trail.